Gary Roberts Water Treatment Plant Wednesday in Blue River. This facility was built in 1971 and is currently the town's only source of water. Breckenridge Town Council unanimously passed an emergency ordinance Tuesday night authorizing a $59 million loan for a new water-treatment plant, but the only emergency was that town staff wanted to lock in a low interest rate. Emergency ordinances require five affirmative votes to pass, instead of a simple majority, and they take effect immediately. On the other hand, standard town ordinances require passage on two different readings at separate council meetings and don’t go into effect for 30 days. Breckenridge Town Council meets the second and fourth Tuesdays of every month, and so authorizing the loan as an emergency ordinance Tuesday effectively saved town staff at least a month and a half they’d otherwise have to wait had council passed it as an ordinary measure. The loan is coming from the state revolving fund through Colorado Water Resource and Power Development Authority, which offers low-interest loans on a 20-year term for qualified-water projects. According to town officials, they feel confident they can secure one for less than 2 percent interest. A 2013 study projected Breckenridge will outgrow its water supply sometime between 2025 and 2030, and the town has been planning the second water facility for several years now. Construction is expected to begin in 2018. As such, town staff were seeking to nail down financing for the project Tuesday, and with council’s approval, they can proceed with the next steps for execution of the loan, which they expect to close in mid-November. The existing facility, the Gary Roberts Water Treatment Plant, was built in 1971. It’s currently the only source of water for the town and leaves Breckenridge without a viable backup in case of emergency or plant failure. Additionally, the town has kept water levels low at the nearby Goose Pasture Tarn Lake because its dam’s spillway has been found to have structural deficiencies. 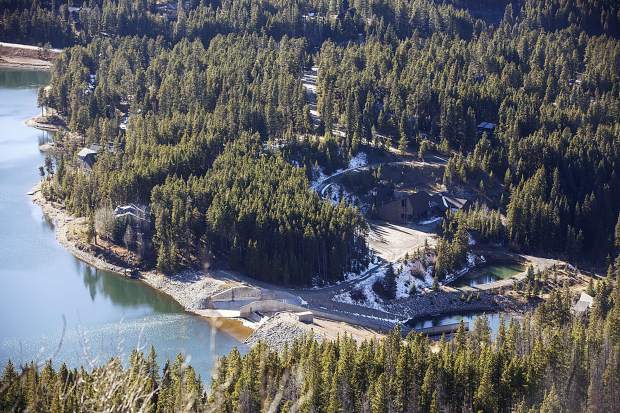 State and town officials are confident the dam will hold given current mitigation efforts, and that’s a good thing because the town can’t begin work on the dam until the second water plant is complete. Tuesday night’s emergency ordinance passed unanimously. Councilman Mark Burke missed the meeting after attending a three-hour council workshop earlier in the day. • Council unanimously passed on first reading an ordinance allowing for the appointment of an alternate member to its Liquor and Marijuana Licensing Authority. The alternate would attend meetings in case one of the panel’s regular members is absent and they’re unable to form a quorum, which requires three of the five-member panel be present. • Council approved a two-year lease with Summit County Human Services to rent out space in the Breckenridge Grand Vacations Community Center for the Treetop Child Advocacy Center. The nonprofit group is leasing out the “coffee shop” space there for $852 a month to serve as a key location within the 5th Judicial District for investigations and interventions in child-abuse cases. The terms of the lease are standard for nonprofits in Breckenridge, town staff said. • Council approved a resolution on first reading renewing a five-year intergovernmental agreement between the town and Summit County government that facilitated the town’s Free Ride system taking over the Breckenridge North-Purple A bus route. Prior to 2012, Summit Stage operated that route. • The High Country Conservation Center presented information regarding a possible Save As You Recycle program in Breckenridge. A group of three trash and recycling haulers, property management and lodging companies, representatives from the restaurant industry, town staff and other stakeholders has met several times since fall 2016 to develop a proposed framework for such a recycling program. The goal is to divert a higher percentage of recyclable materials from the landfill. According to HC3, Summit County lags behind the state and national recycling averages. Council expressed its support for a recycling program but prodded the environmental group for more information about potential costs and implementation. • Council expressed overwhelming support for a climate-change resolution stating the town’s commitment to having all buildings in town, including private businesses and homes, powered entirely by renewable resources by 2035. A task force has been pushing for the townwide resolution for months, and it appears the task force has made the necessary tweaks to gain its passage. Only one council member, Wendy Wolfe, expressed reservations Tuesday about backing the proposed resolution as it’s written. • Council gave communications and marketing coordinator Haley Littleton some direction as the town seeks to create a rotating lineup of banners to hang along some of Breckenridge’s most traveled thoroughfares, highlighting certain town happenings and events throughout the year.